Charity-project-turned-TV-show Coffee Friends is available on tvN in Asia every Saturday at 21:00 (GMT+8)! In today(2 Feb)’s episode, audience will see TVXQ’s Yunho join as the new part-time employee to help out at the cafe. tvN’s new variety show Coffee Friends originates from a charity project of the same name hosted by Yoo Yeon-seok and Son Ho-jun. 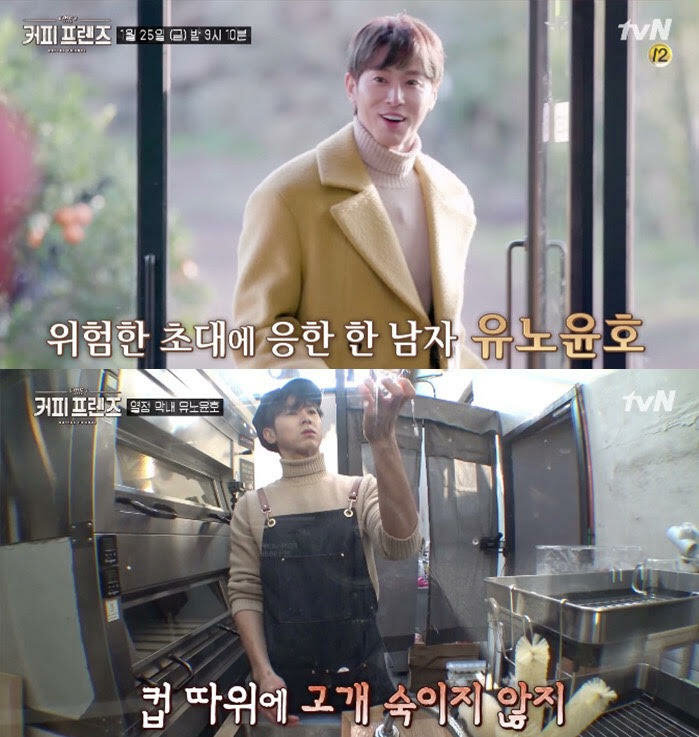 This time, the duo brought this project onto TV screen and turned the mobile coffee truck into a cafe at a tangerine farm on Jeju Island. All proceeds will be donated to charity. In last week’s episode, they launched a new menu to encourage donation from customers, which received overwhelming support and gave much laughter to the viewers. Indeed, during the production conference held earlier Ho-jun already revealed the appearance of Yunho and teased that it is going to be filled with funny moments. Stay tuned to see how passionate Yunho is in the upcoming episode’s Coffee Friends! Charity-project-turned-TV-show Coffee Friends is available on tvN in Asia every Saturday at 21:00 (GMT+8)! tvN is available in Hong Kong, Singapore, Taiwan, Malaysia, Indonesia, the Philippines, Thailand, Myanmar and Sri Lanka. The show is paired with English, Chinese, Bahasa Malaysia, Bahasa Indonesia and Thai subtitles.